1. Regular activity is essential for good physical and mental health, the amount is hard to define but most days of the week you likely need 60-90 minutes of activity. 2. Low intensity activity like walking can make up most of that activity but there is evidence that a few times a week the intensity should be high enough to make you breathe heavily for 15-30 minutes, equivalent to running or walking steep inclines. 3. As we age, activity to keep muscles strong and flexible as well as activity to promote balance and agility is at least as important as cardiovascular exercise. Most days of the week you will benefit from even a few minutes of this type of activity. 4. Exercise can help maintain a healthy weight but weight management and weight loss is more a factor of good nutrition than anything else, for weight loss consult a professional dietitian. 5. Outside activity is another essential element to good physical and mental health, exercising outside as much as possible will pay big dividends. 6. Exercise is medicine, it helps reduce many chronic diseases… however that does not sustain motivation for most people… find activity that you enjoy and want to do for the activity’s sake and let all those other benefits flow in like a bonus cheque. 7. Don’t measure against others (except in a sporting sense). It is clear that we all have different likes, abilities and aptitudes that make our physical activity profile unique. Enjoy the socialization but have the courage to be the unique physical being you are designed to be. 8. Physical activity has a dose response… different amounts and intensities give different outcomes, this means variety will give the most well rounded outcomes. It also means that diminishing returns eventually happen as total volume increases and eventually physical activity levels can reach a point where they are detrimental. Dose response is specific to each individual and is unique to your genetic profile. 9. Sadly, a few individuals have severe diseases that limit their activity but before you play that card remember the amount of people who truly cannot find some activity to work around their challenges are exceedingly small and many people have shown they can beat those challenges and still enjoy activity on their terms. Here’s to a happy, healthy and active 2019 my friends!! New Brunswick runners blew into the Windy City last weekend for the Chicago Marathon with some amazing performances. The highlight of them all was Shelley Doucet of Quispamsis setting a new record for New Brunswick women with a 2:38:49, 15th overall, 2nd Canadian and top of her age group simply amazing. At the Valley Harvest Marathon in Wolfville New Brunswick runners nabbed some great results. Annie Michaud of Moncton won the Ultramarathon for women in 5:04:01 followed by Julie Belanger of Shediac in 5:09:51. In the men’s Marathon, Korey Nixon of Rothesay was third overall in 3:09:53. Closer to home, the Sweet Caroline Run in Rothesay was another big success celebrating its’ fifth anniversary. In the men’s 10-km Evan Arsenault led the way in 34:31 followed by Saint John’s Alex Coffin (38:40) and Cameron Harris of Quispamsis (39:22). The women saw Sacha Hourihan take off with a 37:58 followed by Alicia Postuma of Quispamsis in 49:25 and Brittany McGraw of Saint John in 49:46. In the 5-km it was Katherine Miller (Saint John) and Susan Teakles (Sussex Corner) in a very close finish 22:45 to 22:46, doesn’t get much closer than that. Third place went to Grace Tilley of Rothesay in 24:05. For the men it was Ben Evans of Hampton in 20:21 followed by Rothesay’s Garrett Dixon (21:53) and Sam Dumouchel of Saint John (22:42). It is quite a tribute to Caroline that at least one podium member of every race was from the under 19 age group, no doubt friends and school mates of the late Caroline Lorette who the race honours. It isn’t often you get to write about someone running a hundred races, rarer still one hundred half marathons, but almost unheard of to write about someone running the same half marathon one hundred times. This past Sunday at the Demi-marathon de l’Acadie, that is exactly what Donald Cormier of Tracadie has accomplished. That is more than 1 in 4 of the 372 runnings of this iconic event and a total of 2,110 kilometers of racing. Félicitations Donald that is an impressive accomplishment and why you are this week’s Person on the Run. It was another record breaking weekend in New Brunswick at the Hampton 5-Miler. Shelley Doucet of Quispamsis set a new course record for this 18-year-old event with a very fast 28:40. The second place woman was Sacha Hourihan of Southfield in 30:36 and one second behind her, in a new New Brunswick under 19 record was Saint John’s Erin Vringer in 30:37. The men were very impressive as well with Evan Arsenault of Quispamsis leading the way in 26:55 ahead of Nicholas Larade of Fredericton (27:40) and Jeff Queen of Saint John in a personal best time of 28:37. In Bathurst the action was on the trails and still amazingly fast as Lee Roy of Bathurst was the top 10-km runner in 35:43 ahead of London’s Ben Hope in 36:30 and Bryan Thomas of North Tetagouche in 38:46. The Nathalie’s were at it again as Natalie Theriault of Beresford took top spot in 47:29 and Nathalie Guerette Pelletier of Petit-Rocher Ouest was third in 48:17 and Joelle Hache of Petit-Rocher split the two for second place in 47:49. The 5-km event went to Sylvie Leblanc of Bathurst in 22:57 for the women followed by Lanne Mersier of Petit Rocher Nord in 25:14 just ahead of Catherine Mallet of Whitehorse in 25:40. The men were led by Jonathan Roy of Beresford in 19:39 followed by Marcel Mercier of Petit Rocher Nord (22:50) and Alain Gallant of Bathurst (24:38). In Dieppe the Crossroads Relay had corporate teams going head to head for a 4 runner, 10-km relay race in support of Crossroads for Women, helping women and children living with domestic violence. The top team was ASEA-fast kids in 40:34 ahead of Major Drilling in 47:36 and L’equipe des Rouges in 49:48. Kudos to the business and runners taking on a great cause. 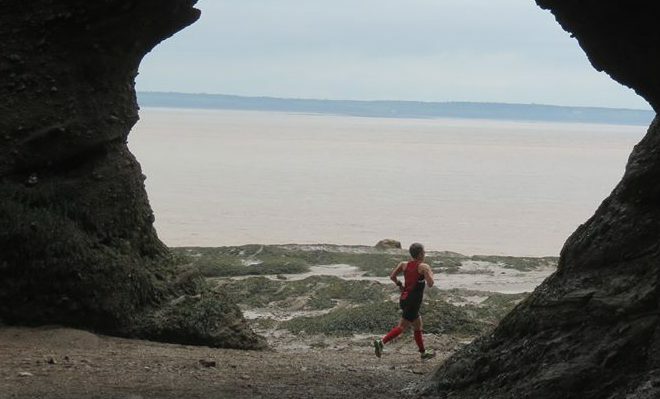 This week our Person on the Run goes to a remarkable young runner from Saint John, Erin Vringer. At only 14 years of age she is racking up an impressive running resume including third place in the provincial 5-Mile Championship in Hampton this past weekend in 30:37. Mark her name in your program, she is one to watch. Another week and another record for the amazing Shelley Doucet of Quispamsis. At the Demi-marathon de l’Acadie Doucet broke her own record with a very fast 1:18:24. and what is more amazing it was a last minute plan to get a training run in before her big race in Chicago next month. Second place went to Natalie Boivin in 1:34:55 and third to Natalie Theriault-Roy in 1:40:12. Lee Roy was also training for a big event next month but joined in and took top spot in 1:17:58 ahead of Shelley’s husband Evan Doucet (1:20:46). Meanwhile in Saint-Francois at the provincial half marathon championships the big winner for the men was Bryan Thomas of North Tetagouche in 1:16:52 followed by Staphane Boudreau of Caraquet in 1:25:00 and Nikolay Ryabkov of Fredericton in 1:25:32. The women were led by Isabelle Thibault of Edmunston in 1:40:22 ahead of Louise Connely of Edmunston in 1:42:34 and in third place maintaining the 2 minute symmetry was Sue Teakles of Sussex Corner in 1:44:18, the 2 minute symmetry between runners in a weird coincidence went to all the way to 5th place. In the 8-km event Tristan Morneault of Dieppe was top male in 31:13 while Emily Roy of Saint-Constant was top female in 39:19. The 5-km went to Andon Morneault of Dieppe in 19:45 for men and Melissa Lebrecque of Levis in 20:31 for the women. At the September Run for Renee the men had a tight finish as Justin Young took top spot in 16:50 just ahead of Trevor Funk in 16:56 and Daniel LeBlanc in 17:03. Suzanne Doucet led the women in 22:08 followed by Sarah Holland with a personal best time of 24:37 and Charlene Smith in 29:08. This week our Person on the Run goes to Sarah Holland of Saint John. Sarah has been showing her speed on both road and trail this season and had a PB at Septembers Run for Renee taking second place. The big event last weekend was the Joe McGuire Road Race in Woodstock. In the 10-km it was Nicholas Larade of Fredericton leading the way in 35:07 followed by Montreal’s Paul Nozicka in 35:50 and Jeremy Ritcey of Sai Kung HK in 37:47. For the women the top of the podium went to Mary-Beth Jaillet of Moncton in 40:48 ahead of hometown girl Phyllis Daigle (49:16) and just 3 seconds later by Anna Bernard of Mazerolle Settlement in 49:19. The women’s 5-km went to Meg King of Mapledale in 25:59 chased closely by Maggie Dunlop of Upper Woodstock (26:36) and Melissa Fitzherbert of Red Rapids in 26:53. The men’s leader was Dawson Nancekievill of Somerville in 17:15 ahead of a dead heat between David Bates of Houlton and Tim Green of Florenceville in 20:34. This week our Person on the Run goes to Denise Landry-Nadeau of Edmunston. Earlier this month she represented Canada at the ITU Long Course Triathlon Championships in Denmark. Then this past weekend she was the Co-Chair and participant in the very successful Tour of Hope Ride covering over 650-km. A great athlete who always gives back to her community. Merci Denise! Triathletes were busy in Beresford at the Triathlon Chaleur 2018. In the Sprint Triathlon there were some incredible performances. Leading the way for men was Moncton’s Cedric Boily in 57:08 followed by Lee Roy of Bathurst in 1:01:19 and Kevin Heppell of Charlo in 1:05:50. The women were led by Kamylle Frenette of Dieppe in 1:10:36 followed by Donna Trites of Fredericton in 1:12:08 and Eryn Weldon of Moncton in 1:12:44. The duathlon went to Beresfords Nathalie Carrier (1:29:49) for women and Sylvain Arseneau of Petit-Rocher (1:00:50) for the men. In Shippagan the 5-km event went to Guillaume Blanchard of Caraquet in 19:40 for the men and Jasmine Grenier of Sherbrooke in 23:24 for the women. In the 10-km Maude Breau of Tracadie was top woman in 1:01:38 followed by Christie Beaulieu of Robertville in 1:05:01 and Line Paulin of Quebec in 1:06:12. The men were led by running legend Rejean Chiasson of Toronto in 33:03 followed by Bryan Thomas of North Tetagouche in 34:57 and Dieppe’s Jonathan Legault in 39:34. One of the iconic trail runs of the summer is the Herring Run in Mascarene. This family operated run is on the rugged coast of the Bay of Fundy thanks to some kind land owners who share their property each year for this great event. The participants were world class, top male at the 20-km distance was Olympian Joel Bourgeois in 1:38:51 followed by Ethan Neiderer in 1:39:30 and Evan Doucet of in 1:51:11. The women were led by running super start Shelley Doucet in 1:38:52 followed by Heidi McLellan in 2:08:16 and Lindy van der Linde in 2:09:41. In the 10-km, Evan Arsenault was top male in 45:39 and Lisette Caissie top female in 1:09:23. The road runners were also busy with the Run for Renee 5-km in Quispamsis with Brady Graves taking the honours for men in a very quick 15:43. The women’s crown went to Claire Reevey in 21:25. This week our Person on the Run was truly on the run. In a span of 29 hours Donna Trites of Fredericton completed two triathlons in two different provinces. On Saturday she completed the Chaleur Sprint Triathlon in second place in 1:12:08. The next day she raced in an Olympic Distance Triathlon in New Glasgow Nova Scotia at the Melmerby Triathlon in 2:25:38 also for second place. That is truly a weekend on the Run.